What is the second most important end times sign? Bill Salus: What do you think is the second most important sign of the end times? Dr. Reagan: My Living on Borrowed Time panel of 22 Bible prophecy experts gave some very interesting answers to that question, "What do you consider to be the second most important sign of the end times?" I knew there would be a lot of scattering of answers to that, and that's exactly what happened. Apostasy — Six of the experts said that they thought that the second most important sign was spiritual corruption in the Church today. That certainly is a major sign, because the Bible speaks over and over of the fact that in the end times there is going to be tremendous apostasy in the Church. Not only the development of cults, but in the Church itself there is going to bring in all kinds of spiritual darkness and apostasy. Oh, Brother, are we are seeing that all around us today! We're right up to our ears in apostasy. You know, 20 years ago, if I had told you that I believe churches would be ordaining homosexuals and performing homosexual marriages, you would have thought I was as crazy as a loon. And yet, that's happened. It's happened in a very short period of time. We've got major "evangelical" leaders today who are denying that Jesus is the only way to God. They are claiming that there are many different roads to God. There's gross apostasy in the Church today, and the term "evangelical" has ceased to have any meaning. Revival of the Roman Empire — Four of our people decided that they thought the second most important development was the revival of the Old Roman Empire through its resurrection in the form of the European Union today. That certainly is a very important development that people have talked about for several hundred years. Long have we known that was going to happen, and so it has happened right before our very eyes. God and Magog — Third place was the Ezekiel 38-39 alignment of nations that are going to align up with Russia. The nations that are going to align with Russia are all Muslim today. That alignment is happening right now. We are seeing Iran for example forming an alliance with Russia that has never existed before. Technology — Tied with one other sign was modern technology. Things such as the Internet and satellites are helping us to understand prophecies we never understood before. For example, the Bible says in Revelation 11 that there will be two great witnesses of God who in Jerusalem will prophesy for the first 3.5 years of the Tribulation. Their mission is to call the world to repentance. They will be killed 3.5 years in and the whole world will look upon their bodies for 3.5 days. Nobody understood that prophecy until the mid-1960's. How could the whole world look upon two bodies lying in the streets of Jerusalem? Well, today there is satellite television. All you have to do is point a TV camera at them, zap it up to a satellite, and the whole world can watch. Jerusalem — Two of our respondents, one who has gone on to be with the Lord being Jack Kinsella, picked out the Jewish reoccupation of the city of Jerusalem on June 7, 1967 as the second most important sign. There were others who picked other signs. It was very interesting to read all of the different second most important signs that people selected. Bill Salus: Among the second most important signs you mentioned was the revival of the Roman Empire. That's an important sign to be watching. Another book David's written is called The Man of Lawlessness: The Antichrist in the Tribulation. It's a very good book where you dispel the trend towards some of these people thinking that the Antichrist will be a Muslim. One of the detractors to the sign of the revival of the Old Roman Empire is this new paradigm shift, not embraced by a lot of traditional teachers such as yourself and me, is those who believe the Antichrist will come from an Islamic state. That idea detracts from the importance of the miracle that is the revival of the Roman Empire. Dr. Reagan: Yes, here is a major prophecy being fulfilled right before our very eyes, and they are yawning over it. The Muslim Antichrist people are saying, "Oh, the European Union doesn't have anything to do with end times. The end times are all going to occur over there in the Muslim world." 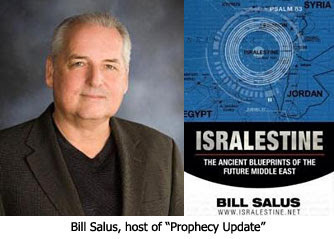 In the fourth segment of my interview with Bill Salus concerning the converging end times signs, we'll discuss the meaning of the fig tree prophecy. Could you please stop claiming that the Roman Empire has revived? The EU covers less than a third of the Roman Empire and excludes most of its important centres apart from Rome itself. Thus the whole of North Africa, the Middle East and Asia Minor were in the Roman Empire and aren't in the EU, whilst Ireland, Sweden, Denmark, Finland, Germany, and Poland are in the EU but were never in the Roman Empire. The European Union is quickly becoming Sharia and with that comes persecution of Jews and Christians. I don't believe there will be much distinction between Islamic occupations and the revival of the Roman Empire via European Union. The second point apart from this is: I believe soon that Hamas and their ilk will appear to have an about-face and recognize Israel's right to exist. Then after Israel concedes more land for peace, the final war heats up as the land of Abraham, Issac, and Jacob will be "from the river Nile to the river Euphrates."